Undeniably one of the best up and coming players on tour at the moment, Maxim Landa is spearheading the NextGen movement. At the age of 22, he’s currently unranked, but has a Career-high of 1473 in singles. An outstanding achievement for such a youngster. 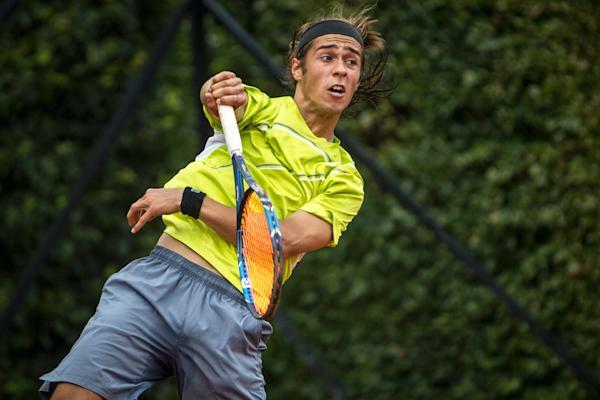 He was last seen at the Finland F1 Futures last summer, where he lost in three sets to the legendary Aaro Pollanen. He hasn’t played in about a year, but he is definitely one to look out for in the near future. Below #10,000 and over 30 years old now, please. Then, we’ll visit the Senior Tour. What's his racquet specs? Do they sell the exact same racquet he's using at the retail shop or is it just a paint job work? They probably sell that one, I’ve seen other players use the same exact pattern. Not sure what it’s called though. He looks like the perfect mix of Federer/Nadal/Djokovic. I see interesting similarities to Murygoat. Used to subscribe to Maxim! Opened my eyes, for sure. Perhaps it's time to resubscribe and broaden my horizons, once again!